﻿ What should I use to clean my baby’s teeth? You might think babies don’t need to brush their teeth, especially when they don’t have any. But by starting good habits like brushing when your child is young, you can lay the foundation for them to continue those good habits into adulthood. The best time to start brushing your baby’s teeth is before he or she has any. Develop the habit of wiping your baby’s gums with a wet, soft washcloth or gauze every day. There is no need to use toothpaste, just wrap the gauze or cloth around your finger, moisten it with a little water, and gently rub it over the gums. This helps your little one get used to brushing while it eliminates bacteria in the mouth that can harm emerging teeth. You don’t need to apply a lot of pressure or even take very long: just a quick, gentle rub over the gums will do it. 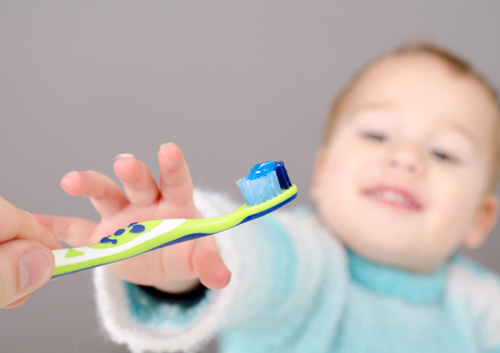 When your child’s teeth begin to come in, you will need to switch from a cloth to a baby toothbrush. Find one that has a grip big enough for your hand, but a head that is small enough to maneuver easily in your infant’s mouth. You don’t need to use any toothpaste until your son or daughter is about a year old. Even then, though, you’ll want to use just a tiny amount: about the size of a grain of rice. When your toddler is about two years old, you can use a pea-sized amount. By around six years of age, your child will probably rinse and spit without your help. At that point, you may want to introduce a child-friendly fluoride mouthwash. Your child probably won’t be able to brush his or her teeth alone until about the age of five or six. This means that you will need to do it. To brush your child’s teeth, gently use the brush over all the teeth and gums, even areas where the teeth have not come in yet. As your child grows and becomes more independent, you can allow him or her to hold the toothbrush while you guide your child’s progress. Make sure you talk to your child while you are brushing, and explain why you brush: what you are doing and how you are doing it. In addition to regular visits with Dr. Philip Friedman, instilling good oral health habits in your child early on will ensure a lifetime of good dental health.